Thomas Hampson offers a rare opportunity to hear the baritone version of this opera’s title part, as arranged by Massenet for the legendary Mattia Battistini. Werther’s tragedy, when performed by a baritone rather than a tenor, takes on an even darker hue. Hampson’s moving portrayal brings out all the idealism, melancholy, and eventual despair of the character over the loss of his beloved Charlotte, sung by Susan Graham. 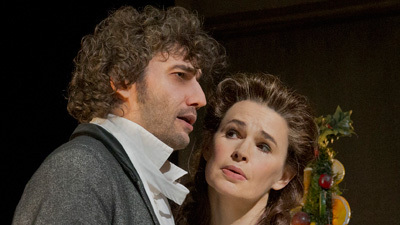 Graham gives an equally heart-rending performance as the young woman torn between her love for the romantic Werther and her promise to marry Albert (Christopher Robertson). Rebecca Evans is Charlotte’s innocent younger sister, Sophie, and Donald Runnicles conducts.